Hawaii is the number one resort destination for Japanese travelers, and ANA operates Boeing 787s on the Tokyo Narita-Honolulu route with a 90% load factor, ANA marketing manager-Europe, Middle East and Africa Nanako Murakami said. ANA will put two A380s into operation this year, on May 24 and July 1, and a third on an unspecified date in 2020. With the first aircraft, ANA will operate three flights a week; the second will bring the total to 10 flights a week. Each A380 will be equipped with 520 seats, more than double the capacity of an ANA 787, Murakami said. The cabin will be configured with 383 seats in economy class, 73 in premium economy and 56 in business, as well as a new eight-seat first class intended for honeymooners. The economy cabin includes Couchiis—three or four seats that convert to a flat bench once the leg rests are folded up. A Couchii can accommodate two adults or one adult and two children. ANA hopes the Tokyo-Honolulu service will also appeal to Europeans flying to Hawaii. The flight would take an additional two hours compared to traveling via the continental US, “but you make a stopover and meet two cultures in one journey,” Murakami said. ANA expects to increase its share of the Japan-Hawaii aviation market to 25% in 2020, up from the current 15%. Hawaiian Airlines, Japan Airlines, United Airlines also serve the market. 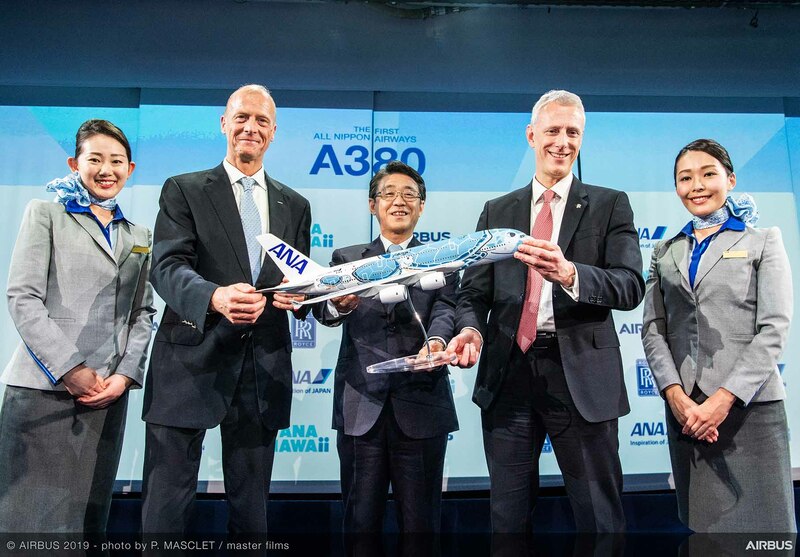 The livery of ANA’s A380s features the Honu, the Hawaiian green sea turtle—a symbol of good luck and prosperity. The paint job took 20 days of work and three metric tons of paint, Airbus CEO Tom Enders said. With the ANA delivery, there are 232 A380s in service with 15 airlines.